I recently read an article in Daily Mail, London, where a woman laments about how tough it is to handle her son..It often drives her to madness and at times she hates him for it. I kind of understand where her emotions come from. Our lives are so stretched, our time limited, our interests varied that it takes a simple shoe tear to make us fly off the handle. Add a naughty child to that, and you have a recipe for a breakdown. Tough on mothers’ today, especially on working mothers. I dare not think of the single mom. Of course my daughter drives me mad. Especially now that she attends full-time school. She chooses her own dress, her shoes, even her clips. Of course it will be the wrong choice for the weather. She wants to wear a sleeveless in 30F. Exasperating to say the least! But this little girl has also shown me new paths. She has inspired me to better myself (if only to set an example). She inspired me to start designing and making new dresses for her. A skill I never thought I possessed. To go with the outfit, a gal always needs the right accessories. So I have ventured to jewellery making. Now neither sewing nor jewellery making was something I ever thought I would do. Nor would I do it for money. The pleasure on her face when she likes her new dress and the matching necklace, earring, bracelet set, is something to die for. This holiday season, she made me ultimately do something I always wanted to but was too lazy to attempt. I actually wrote and printed a book for her. Her class was discussing various holidays around the world. 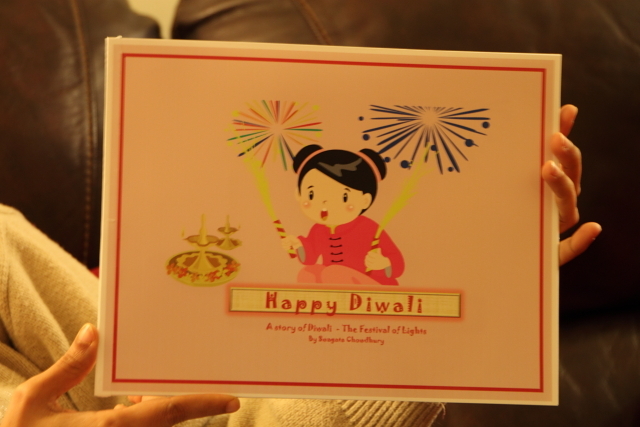 Aditi wrote about Diwali, India’s festival of lights. Her teacher wrote to ask if we had any books or decorations to share with the class so they would understand the concept better. I ran to all the book stores and of course none of them had any book available. Some of us were cheap enough to buy the available book, use it and return it. So the shops stopped carrying the books at site and you could only pre-order it. So after running pillar to post I thought what the heck why not simply make up a story like we normally do. 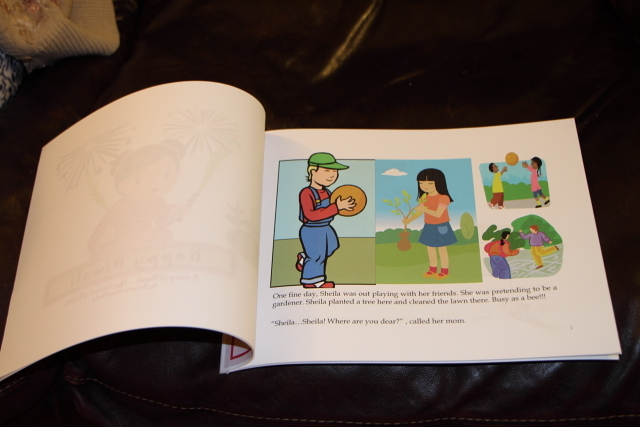 Thanks to MS Powerpoint, I managed to create a story book with Aditi as the heroine. 🙂 I saw the pride on her face when her parents walked into her classroom. I read the book aloud and later gifted it to the class. I am really thankful to my daughter. Usually we parents teach our children things. In my case, my daughter is teaching me to learn new things, build new skills, chart out a different path. Generally I wouldn’t have done any of this. Although I have always wanted to write a book, I never actually sat down to it, until my daughter warranted it. And to all other parents, in case you need a book on Diwali to share, let me know I will forward it to you, free of course. It’s high time we spread some good things about India. This is really inspiring !!! Please send me a copy, Shreya will really enjoy the book. Really happy to read your post. Hope Aditi is doing fine. Do send me a copy on email if possible. Would love to see your work as the pictures are really interesting. Awesome.. Great job 🙂 please forward me a copy. Hey Kash, sent u a copy..hope u enjoy it! Thanks! Well done Aditi and Swagata! Brought tears of joy to my eyes! I feel so proud of you although we are not related!